Fabric…my favorite “F” word and one of my favorite things in the world. Should a situation occur that requires the rate of my heart to beat faster all I have to do is walk into a fabric shop! It may even skip a beat or two but there would be nothing to worry about…this is not the precursor to a heart attack. It’s just how a “Fabriholic” responds to quilt fabric – and it only becomes more intense in the presence of designer quilt fabric. What Exactly is Designer Fabric? In the world of fabric there are many, many options and correlating price ranges. Bargain fabric often purchased at a chain or big box store is much less expensive but the quality is also much lower. An exception would in an outlet type store that may from time to time include fabric from a high end manufacturer. Usually the fabric offered is what is left of a fabric line (remnant) and your choices are limited to what is available at that time. Designer fabric, on the other hand is of higher quality. You can hold this fabric up to the light and not be able to see through it. Quilting fabric is also 100% cotton and the manufacturing and dye processes produce fabric a superior product. These higher thread counts – of 70 or so per square inch produce a fabric that is durable and able to hold its shape both during the sewing and quilting process. This translates into less shrinkage and improved longevity and usability of the finished quilt. Improved colorfastness is another advantage. Fabric of higher color intensities, regardless of the fabric quality, will have some bleeding. This is one reason many quilters will first wash their fabrics before starting any aspect of the quilting process. If you do intend to use quilting fabric to sew a garment or any worn item, then washing the fabric first is a must. So now that you have some insight into the various attributes of “high end” fabric, here is a very short list of some quilt fabric manufacturers I have personally used: Moda, Art Gallery Fabrics, Robert Kaufman, Andover, Benartex, Henry Glass, Cotton + Steel, Boundless and Kona Cotton. There are many, many more and each manufacturer carries hundreds of individual fabric lines from hundreds of fabric designers. 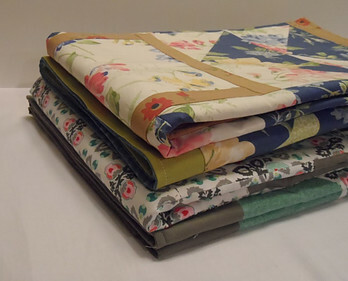 When you are ready to shop for high quality quilting fabric you will soon learn there is no shortage of options. Yes, things have been rolling along so well…blue skies, yellow sun, pink daisies and all that’s good and right with designer fabrics until suddenly, from out of nowhere, a less-than-rosey memory surfaces to the forefront of my stream of consciousness. Believe it or not, there is a downside to using these high end fabrics and that is the limited availability of each and every fabric line. First, you find a fabric or collection you adore and purchase the amount needed for whatever project you have on your list. Seven or eight months down the line you receive a request to create that same project using that same fabric but guess what? It’s sold out – everywhere. And when a designer fabric sells out, it is sold. out. forever. The high cost of designer fabric. The old, old saying, “You get what you pay for” does apply but is it always necessary to use high end designer fabric every time you make a quilt of other fabric project? When determining the true value of a quilt, your time and the complexity of the quilt are also factors. Juvenile prints – especially for a baby – come in the most heavenly colors and the fabric hand is equally divine but is it practical to use expensive fabrics for a quilt that will require washing at least once a week? An argument can be made for either side. The higher the quality of fabric the greater the likelihood the quilt will be able to withstand hundreds of washings. The flip side of course, is that babies grow quickly so, is it logical to spend a lot of time and money on an item with limited use? There is no right or wrong answer – just something to be considered before deciding to use high end / high cost quilting fabric. Each time I purchase quilting fabric from a manufacturer listed above, it will contain a tag which indicates where it was manufactured. So far I’ve received fabric from Japan, Korea, South Korea, Indonesia and Thailand. ( I can’t help but wonder how this also has an effect on the overall purchase price of the fabric). For those who are concerned about the outsourcing of these manufacturing jobs and prefer to purchase from American manufacturers this may also be an issue. (Oh no…another interruption in my stream of consciousness – a memory from the not too distant past where most, if not all, designer wall coverings were manufactured in Europe…hmm). Now I’m curious…has the same thing happened to fabric? Are there any fabric manufacturers in the USA? With Google as my co-pilot I embarked on a little research and I am happy to report I was able to locate one company in Seattle, WA – American Made Brand. Their logo for their fabric division Clothworks incorporates their philosophy: “Celebrating a Farm to Fabric Movement” in which all aspects of their fiber and fabric manufacturing process occurs onsite. 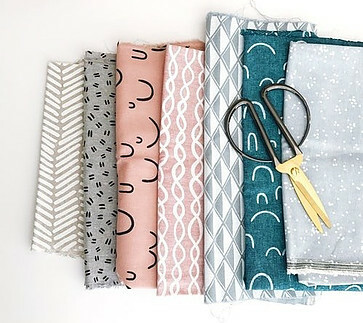 In conclusion, I am an admitted fabric snob and will prefer designer quilting fabric over lower quality fabric most anytime with this one exception – that is when practicing the beginning sewing basics or learning a complicated pattern or block. Use the cheap stuff for this and other basic techniques described here. I would love to hear your thoughts on designer quilting fabric. Tell me your favorite manufacturer and do you prefer making your fabric purchases online or in your local fabric shop. Adding a photo of your latest fabric shopping experience would be fun also! I do thank you, as one “fabriholic” to another, for the trip through your mind as you explore quality quilt fabrics. I’m especially glad to know that there is at least one made-in-America resource. I do agree with your self-labeled “snobbery:” Quality fabrics are such a joy to play with. However, as you point out, very often these fabrics are limited-edition, which sort of means you may not be able to duplicate a project using the exact same materials. That really is not such a bad downside, actually…. Thank you for stopping by and I sincerely appreciate your comments! Comparing these high end fabrics to those of lower quality remind me of a few years ago when I first tasted Godiva chocolate. After that I could not go back to Hershey’s! And if there is a downside to Godiva chocolate, like our favorite fabrics, it wouldn’t be that much of a downside either!